Details of Scottish merchant and privateer, William Kidd (c. 1645-1701), famously a.k.a. Captain Kidd's early life are unknown, but he gave Greenock as his place of birth and his age as 41 in testimony at the High Court of the Admiralty in the mid-1690s. His father, John Kyd, may have been lost at sea, but suggestions that he was a Church of Scotland minister can be discounted since his name does not appear in comprehensive Church records for the period. By the 1680s William Kidd was operating a small fleet of trading vessels out of New York, but he enters the historical record as a member of Jean Fantin's pirate crew in the Caribbean in 1689. Kidd seems to have been appointed captain after the crew mutinied, ousted the French captain, renamed the vessel the Blessed William and sailed to the British colony of Nevis. The island's governor, Christopher Codrington, enlisted Kidd and company into a small fleet defending Nevis from the French but did not pay them for their services, suggesting that they claim their pay from the French. They did so in a raid on the tiny French island of Marie-Galante, between Guadeloupe and Dominica, destroying the town of Grand Bourg, and gathering around £2,000 sterling in loot. Most of the crew promptly deserted with their shares of the booty and headed for New York. Kidd followed them and arrived in the middle of a local rebellion. He joined the government forces sent out to suppress the uprising, which brought Kidd into favour with the colonial establishment, including fellow Scot Robert Livingston. On 16 May 1691, he married the twice-widowed Sarah Bradley Cox Oort, one of the wealthiest women in New York, thanks to an inheritance from her first husband. Kidd remained in New York with occasional excursions as a privateer until 1695. He and Livingston then concocted a proposal for the newly appointed governor of New York and Massachusetts Bay, Richard Coote, 1st Earl of Bellomont a scheme that took them to London. Bellomont had replaced the corrupt Benjamin Fletcher, who had allegedly been accepting bribes to allow pirate loot to be traded in New York. Kidd and Livingston proposed a mission to crack down on piracy in the Indian Ocean. In theory, the venture would hunt down pirate ships, capture the crews and impound their booty. They would then bring everything back to London, New York or Massachusetts, where the villains would be tried, their treasure condemned, and the proceeds divided among the investors. Kidd, Livingston, and Bellomont would be the acknowledged investors in the scheme, but four-fifths of the capital would come from a coterie of Whig noblemen. His backers included including Edward Russell (Earl of Orford and First Lord of the Admiralty), Henry Sidney (Baron of Romney, Master-General of the Ordnance and Colonel of what became the Grenadier Guards, Sir Charles Talbot (1st Duke of Shrewsbury, 12th Earl of Shrewsbury and 12th Earl of Waterford), and Lord High Chancellor Sir John Somers. Kidd's letter of marque was personally signed by William III and reserved 10% of the proceeds for the Crown, and the King may have fronted some of the money for the voyage. Kidd left England in April 1696 in the 34-gun Adventure Galley, with a crew of seventy and commissions to hunt down pirates, attack French commerce, and keep the cargoes he captured. His first destination was New York where he would enlist more crewmen and inform his wife and two daughters of his plans. In New York Kidd recruited ninety men, the majority of whom were known and hardened criminals, and undoubtedly included former pirates. After departing New York on 6 September 1696, Kidd stopped off at Madeira for wine and the Cape Verde Islands for salt, then headed south to round the Cape of Good Hope. An encounter with a Royal Navy squadron just before they reached the Cape could have seen half of Kidd's crew pressed into naval service, but a calm allowed the Adventure to sneak away under oars. They reached Madagascar, on 27 January 1697 without further incident, but English naval authorities were already suspicious of Kidd’s intentions. After restocking supplies of fresh food and water, the Adventure Galley sailed north for the Comoros to careen and refit the vessel. Along the way, they came across several large, well-armed East Indiamen, who wanted nothing to do with the alleged pirate-hunters. While the stop in the Comoros seems an obvious preliminary to their mission, an outbreak of cholera took out one-third of his crew by the time the Adventure Galley left the islands, and Kidd spent several weeks trying to replace them. An outbreak of cholera killed one-third of his crew in the Comoros, his brand-new ship was leaking, and he failed to find the pirates whom he expected to encounter off Madagascar but does not seem to have been over-diligent in the search. Ile St. Marie, off Madagascar's east coast, was a well-known pirate base, home to around two hundred pirates. Instead, Kidd followed the April monsoon northward to the Strait of Babs-al-Mandab, at the mouth of the Red Sea. If he could raid the fleet, sink the vessels without leaving a trace and return with their cargoes, he may have been able to claim the booty had been seized from pirate ships. The pilgrim fleet was, however, accompanied by capable Anglo-Dutch escorts, including the East India Company's Sceptre, which mounted an aggressive defence of the convoy. Short of food and water, Kidd sailed for the west coast of India, where agents of the East India Company established his intentions and Portuguese vessels engaged the Adventure Galley off Goa. Unsuccessful attacks on trading vessels saw Kidd's crew become restive. At Calicut, he encountered more representatives of the East India Company, and the Adventure Galley had a close escape from his British pursuers in Tellicherry. With the crew on the verge of mutiny, Kidd lashed out at his gunner, William Moore, killing him with a wooden bucket after he criticised the captain's reluctance to attack a Dutch ship. That would have been out-and-out piracy, and would undoubtedly have angered Dutch-born William III. While Kidd's luck subsequently changed and he went on to capture six ships, only two were legitimate prey under his letter of marque. The Rupparel, a small, Dutch-owned dry goods carrier, produced French papers after the Adventure Galley approached her flying French colours but delivered little in the way of booty. The other, the 400-ton Quedagh Maiden, taken on 30 January 1698, with a cargo of satins, muslins, gold, silver, East Indian merchandise and silks, had an English captain named John Wright, who had papers from the French East India Company. Kidd again flew French colours and, finding a fellow countryman in command, seems to have tried to persuade his crew to let the vessel go, but ended up keeping the ship, which he renamed the Adventure Prize in an attempt to maintain his tenuous control over his crew. One of the passengers aboard the ship, an Armenian merchant named Coji Babba offered a ransom of 20,000 rupees. Kidd rejected the offer, sailed to the port of Caliquilon and sold the bulk of ship's cargo for, reputedly £7,000. Kidd kept the vessel's French documentation, and while the passes were, at best, a dubious defence he was probably hoping that they would provide a veneer of legal justification that might get him off the piracy hook as far as the Quedagh Merchant and her cargo was concerned. By now the Adventure Galley was in poor condition, so Kidd headed for the pirate base of Ste Marie, just off the coast of Madagascar with a significantly happier crew. The galley was leaking, the pumps needed eight sets of hands to work them around the clock, but they had captives who could do the majority of the physical exertion. When she arrived at Ste Marie at the start of April, Kidd openly consorted with the pirates he had been sent out to capture. After salvaging whatever hardware he could, Kidd then scuttled the Adventure Galley, offloaded most of his crew, who preferred to try their luck in the Indian Ocean and headed for home in the Adventure Prize with a thirteen-man crew. In the meantime, the Mughal government in India had objected strongly to the East India Company about the activities of English pirates in general and Kidd in particular. The East India Company had their own issues with Kidd, and by 1698 he was a wanted man, and there was little his powerful patrons could do to protect him. In fact, given the political embarrassment Kidd's activities could bring down on the Whig government, it was in their interest to prosecute rather than protect. So, in April 1699, after his two-year cruise, Kidd's first landfall in the Caribbean (Anguilla, at the northern end of the Leeward Islands) revealed that a warrant was out for his arrest on charges of piracy. He moved on to the Virdin Islands, seeking refuge at the Danish island of St Thomas. When that was refused, the Adventure Prize moved on to Mona Island, west of Puerto Rico, and from there to a remote spot on Hispaniola, where Kidd could offload much of his cargo to entrepreneurs who resold the goods in Curacao, St. Thomas, and other Caribbean nodes where questions of provenance were unlikely to arise. Kidd also disposed of the Adventure Prize, bought a smaller sloop, the San Antonio, and continued to work his way along the east coast of North America, offloading crew members and cargo whenever he could. Off New York he managed to establish clandestine contact with Livingston and Bellomont, hoping to make some deal that might secure his freedom. There may or may not have been promises of clemency involved, but Kidd surrendered himself in Boston on 6 July 1699. Since Bellomont's best chance of saving his neck involved returning Kidd to England in chains, once he was in custody any deals were off. 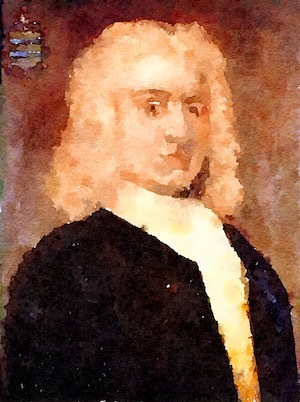 Kidd found himself in prison, most of the time in solitary confinement through the winter of 1699— 1700. He was then shipped to England) in February 1700, interrogated in mid-April, and consigned to Newgate Prison shortly after that without access to lawyers and the documents he could use in his defence, which subsequently went missing. His Whig backers not only failed to come to his aid; they seem to have gone out of their way to deprive him of the resources to fight the charges of piracy and murder. The documents he held from the Quedagh Maiden went missing but eventually resurfaced, misfiled with other government papers, in the early twentieth century. It seems that the new Tory ministry, keen to exploit the situation for political capital, dangled the prospect of acquittal or clemency in return for names and details of Whig involvement. Called briefly before Parliament as the Tory government sought to impeach Somers and Orgford, Kidd refused to co-operate, apparently confident that his patrons would come to his aid. The High Court of Admiralty predictably found him guilty of five charges of piracy and murder, mainly due to the testimony of the two former crew members who became witnesses for the prosecution in return for pardons. Six of Kidd's associates were also found guilty of piracy but, in the end, were pardoned. A second attempt a few minutes later sealed the issue, and Kidd's tarred body stayed on a gibbet at Tilbury Point for three years as a warning to would-be pirates.